There are a few key things you can do to make your workday healthier. We spend about half our lives in the office, so that space should be as healthy for us as possible. What makes an office environment healthy exactly? Taking breaks to stand up and walk around? Eating healthy snacks? Using ergonomic keyboards? Do plants help us be more creative or just make us feel guilty when they wilt? Well, while plant-derived happiness may depend on your cultivation skills, here are a few key things you can do to make your workday healthier. First, open up the workspace and take advantage of the natural light. 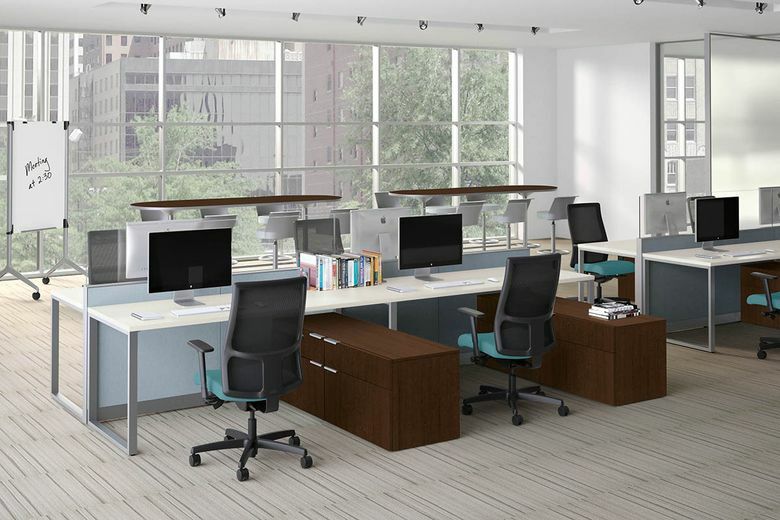 “The best part of office cubicle panels coming down,” says Josh Feinstein from Ducky’s Office Furniture, “is the natural light it brings into the office.” It’s a great way to combat seasonal affective disorder (SAD) and vitamin D deficiencies. At Zillow, the Seattle-based real estate and rental marketplace, Dan Spaulding, the VP of People and Culture, says employee health is of great importance. They lay out the space to meet the employees needs and preferences, with bright, open spaces and command centers with dry-erase boards as well as quiet libraries with doors. Third, big break rooms and healthy snacks. “Break rooms are bigger and more inviting,” Feinstein says. “It’s more like another workspace where people are encouraged to eat.” Spaulding agrees and says that their daily fresh fruit delivery is one of the employees’ favorite perks. It’s so popular that sometimes the fruit is gone by 10 a.m. Even so, Spalding says it’s a great way to encourage employees to be healthy. Fourth, check your desk setup. Feinstein says monitors should be at eye level and straight ahead so you’re not looking off to the side while typing. Also, they should be placed perpendicular to the window or you should use light filtering shades so you’re not squinting at your screen all day. Keyboard trays should be tilted down on a negative incline so you’re not lifting up your wrists. Your phone, mouse, keyboard, and all the tools you use on a regular basis should be within easy reach and range of motion. What about avoiding volatile organic compounds (VOCs) or furniture that off-gasses? Feinstein says office furniture manufacturers have become better in recent years about lowering emissions from their furniture, and most products meet high air-quality standards already. For a little extra reassurance, look for a certification from SCS Indoor Air Quality or a similar organization. However, most furniture you buy these days will already be certified. So how about those house plants? Broad-leafed greenery can clean the air. Some say they can boost your mood and help with healing, that they can make you more creative and help you work better. Maybe with a little effort even those of us most lacking in plant-growing skills can learn to keep them alive, even to help them thrive. I mean, if they’re so good for our health maybe with a little training they could clean our desks or make us coffee, or maybe bring us the last of that fresh fruit from the break room before it’s gone.